Automatic Milking Systems are often referred to as "robotic" or "voluntary" milking systems. "Robotic" refers to the robotic arm that performs key functions of the system (eg cup attachment). The term "voluntary" is used because cows can choose when they want to be milked. They typically consist of a milking stall or crate with a robotic arm that attaches the teat cups to each cow without human intervention, an electronic identification system, and a milking machine. An AMS still requires all the same basic farm management as a conventional system. The processes are just different in order to achieve the final product. The cow enters the crate and is identified via a tag strapped to her leg, around her neck or in her ear. The software determines if the cow has milking permission. If she is not due for milking the front gates open and the cow is released. If she is due for milking the teats are cleaned (optional) and the teat cups attached, one at a time. Teat cups are removed based on flow from individual quarters. While milking, the cow may be offered a concentrate (meal, grain, molasses). Milk is diverted to separate tanks if requested by the operator using the software settings, otherwise it enters the bulk or temporarily a buffer tank. Various data is collected on both the cow and milk quality. These can include live weight, quarter yield, quarter conductivity, colour, fat, protein and SCC. Automatic milking relies on cows volunteering for milking in the AMS and distributing these milkings throughout 24 hours. The main motivator for cow movement around the farm is feed, either fresh pasture and/or concentrate in the AMS. Most AMS farms are set up with two or three new areas of pasture available to the herd daily. Cows access pasture after visiting the AMS or can be diverted directly to the new pasture if milking permission is not granted. How many cows can an AMS milk? A single station can theoretically achieve up to about 160 cow-milkings in a 24 hr period. The cow capacity per robotic station therefore depends on how frequently cows are required to be milked and on milk yield. On grazing farms in practice, this is usually about 130 - 150 milkings per day. How reliable are the machines? Regular preventative maintenance is required, with fortnightly farmer services (mainly checking equipment) and less frequent services completed by company technicians. It is important to realise that while it is no longer necessary to milk the cows staff must be able to be contacted via pager or cell phone to attend to any alarms - which could occur at any time. Some brands have the ability to attend to some alarms remotely and reset the milking station using a laptop computer. How does automatic milking change labour on farms? Automatic milking changes the tasks that people are required to carry out on-farm. Many routine jobs remain, but the timing of those jobs is more flexible. It is still necessary to fetch cows that don't report for milking; set up paddocks for grazing; fill chemical containers; complete regular maintenance on the AMS, monitor reports and keep the AMS clean. It is no longer necessary to move the whole herd to the shed for milking or to put cups on cows. Automatic milking has exciting potential for owners managing multiple farms. Because of the flexibility in work routines and low physical demands of the tasks that need to be carried out on an automatic milking farm, staff and work routines could be scheduled or staggered across farms allowing for more efficient labour use and more respectable hours of work. One person could be on-call to attend out-of-hours alarms for multiple sites. A higher level of skill will generally be required for automatic milking farms and good animal husbandry skills are essential. Staff must be able to interpret information provided by the systems in order to make informed decisions regarding cow health and feeding levels. The importance of people in the success of automatic milking operations should not be underestimated. Not all people will be suited to this technology. For those wanting to reduce the manual workload and spend more time on what matters most like feeding, pasture management, cow health and reproduction then this technology offers exciting potential. All brands of machines are equipped with a range of sensors (e.g. electrical conductivity, somatic cell count, blood, fat and protein) that measure milk quality and udder health at every milking. Some brands have the ability to draft cows automatically if mastitis is suspected and/or direct milk away from the main silo. While each cow is not sighted every day, in an automatic milking situation the herd manager has much more information to determine if a cow has mastitis than in a typical conventional system. Experience has shown that as long as the alert reports are routinely checked and acted on mastitis detection is not a difficult task. Is automatic milking used in other countries? Yes. AMS are in-use in over 22 countries worldwide, mainly central Europe (e.g. the Netherlands, France, Denmark, Germany). The technology is used in farming systems very different from those typically seen in New Zealand. The majority of farms with AMS are housed systems with very high per-cow yields and intensive feeding systems. Can a milking robot keep pace with our current milking systems? No. High-throughput dairies of the present are based on rapid batch milking. Current robotic technology depends on distributing milking over a 24 hr period with a continuous flow of cows through the system. Can robots really put teatcups on cows? Yes, it is now very effective technology, but it does take much longer than for a human to do it. The first commercial automatic milking systems were installed in the Netherlands in 1992. How long does it take for attachment of the teatcups? It may take 45 seconds, it may take up to 3 minutes or more, and depends on cow movement, size of the teats and shape of the udder. The fastest systems will attach all 4 teatcups in approx. 20 seconds once the robotic arm is under the cow. This does not include teat preparation time. For some cows it may take up to 3 minutes, and depends on cow movement, size and shape of the udder. Are some cows not suited to robotic systems? Yes, some cows are not appropriate for either behavioural or teat size or udder shape reasons. However as technology has improved there are fewer cows are not suited to AMS. Farmers report that a smaller number (1-3%) of cows on the New Zealand farms were not suited and these are identified in the early transition period. Cows with very high back quarters and/or teats that overlap can be a problem for attachments. 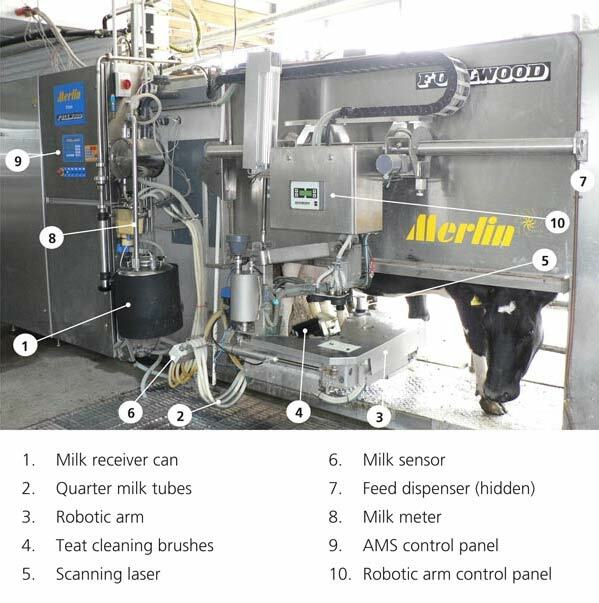 Milking cows seems such an individual and personal operation, how can a robot replace that? Human involvement in the milking process can be much more volatile and irregular than that expected by the cow. The AMS is very consistent and the cows learn what to expect. People still play a very important role and rather than 'losing contact' with their cows, farmers report that the cows become quiter and they know more about each cow than they did when milking conventionally. Much effort has gone into automated systems to check for health, heat, mastitis and monitor milk quality. The systems produce daily alert lists of cows that fall outside the normal range and which should be checked by staff. There is a lot more information available for individual cows than in most conventional milking systems. However, it is critical that the farmers learn how to interpret and work with this data. What are the benefits for the cow? In an automatic system, the cow chooses when to get milked. There is much less herding and forced movement to and from the paddocks. Quarter milking should in theory achieve more even milking out as cup removal decisions are made on flow rate from individual quarters. Farmers report less lameness and quieter cows. There is no evidence that mastitis decreases for AMS but it should not occur at a higher rate than for conventional milking. Do cows prefer a particular robot? Yes, farmers report that some cows show a preference for certain robots. This may be related to the AMS they were trained, in a preference for either left hand or right hand entry sides. Some farmers choose to install a back-up generator, especially in areas where power may be unreliable. If the power is off for several hours there will be a back-log of unmilked cows that can be cleared by changing milking permission settings to prioritise cows. Depending on how long the power cut lasts, it can take a couple of days for cows to settle back into their routine. Can an AMS cope with cows that have three teats? Yes, simply select which teats are to be milked using individual cow settings in the software. How does an AMS deal with treated cows? There are settings that can be changed using the software which instruct the AMS where to direct each cow's milk. Cows who have been treated with antibiotics and their milk must be kept separate from the main herd, are set to dump or milk is diverted to separate holding tanks. What are the main differences between conventional and automatic systems?